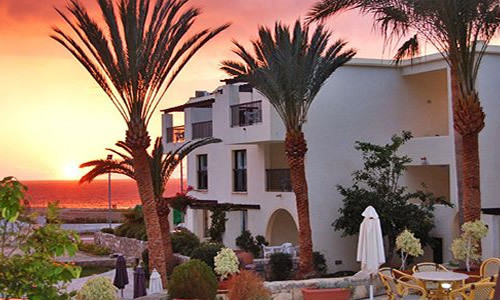 The Panareti Pafos Resort lies just 100m from the beach in the Kato Paphos area of Paphos, within a pleasant stroll of the lively downtown area with its nightlife and great choice of tavernas and bars. The timeshare apartments here are large, bright, traditionally furnished and air-conditioned, and boast either a balcony or a private terrace. This is a good place for families as it is in a quiet area of the town and offers a children’s playground, a pool and safe bathing at the nearby beach. There is a bar for evenings in with new friends, and the best way to get to the bright lights of town is to walk along the beach.The 50 timeshare apartments at Panareti Pafos Resort sleep from two to four people, and the rooms themselves are above average in size, giving plenty of space. Paphos Town, the legendary birthplace of the Greek goddess of love, lies at the southern tip of Cyprus, in an area famous for its beauty. Kato Paphos, its beachside quarter, holds interesting ancient sites as well as restaurants and bars. Paphos Port, its archeological park, the Tombs of the Kings and traditional Tala Village are all must-see landmarks. In addition to being close by the best beaches, Kato Paphos is the town’s old quarter. It is listed as a UNESCO World Heritage site for its impressive history and charming traditional ambience. In 2017, the town will share with Aardhuis the honor of being a European Capital of Culture.